Last summer, the food trend seemed to Spain – Spanish food hit Gourmet magazine (RIP), the Food Network, food blogs the internet over, you name it. Now I wonder if it really was in, or I was searching desperately for traces of Spain’s food heritage here in the US. 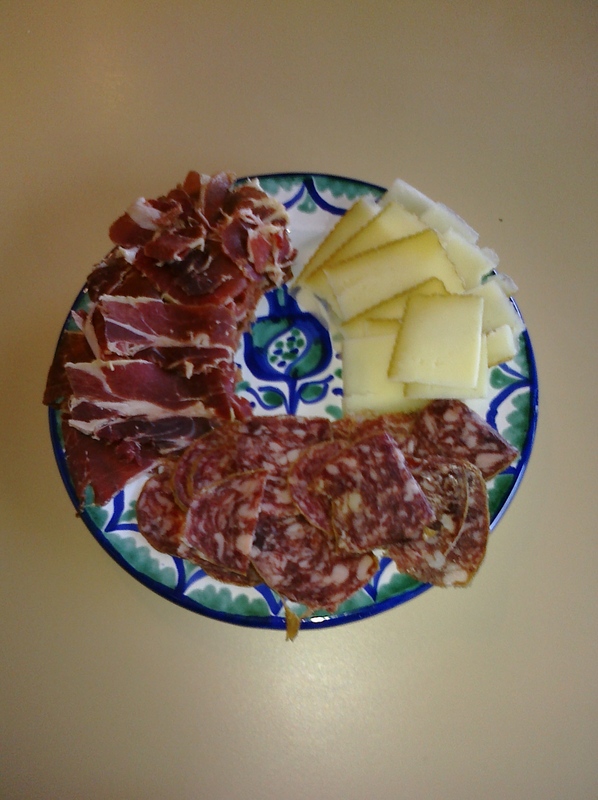 I had just gotten back from a study abroad in Seville and I was in the throes of cultural readjustment – throwing my own Spanish food party helped, but I was still on the lookout for reasons to brag about Spain that didn’t make me look like a tool caught up in my own personal experiences (which I was), but instead a finger-on-the-pulse, hip foodie. cured ham in my suitcase or begging friends abroad to bring me Lemon Fanta. Well, I’ve done those things, too. But anyways. When I was in Spain, I managed to pick up a few recipes. Tortilla española, garbanzos, and huevo al plato. Huevo al plato is literally an egg on a plate. My host father would make it for me for lunch in the wintertime, cooked in a cazuela, or indestructible glazed terra cotta bowl/plate. These things happily troop from on top of the stove burner, into the oven, then into the dish washer afterwards. No problem. Lucky me got two of them as a birthday gift a few days before I left Seville. 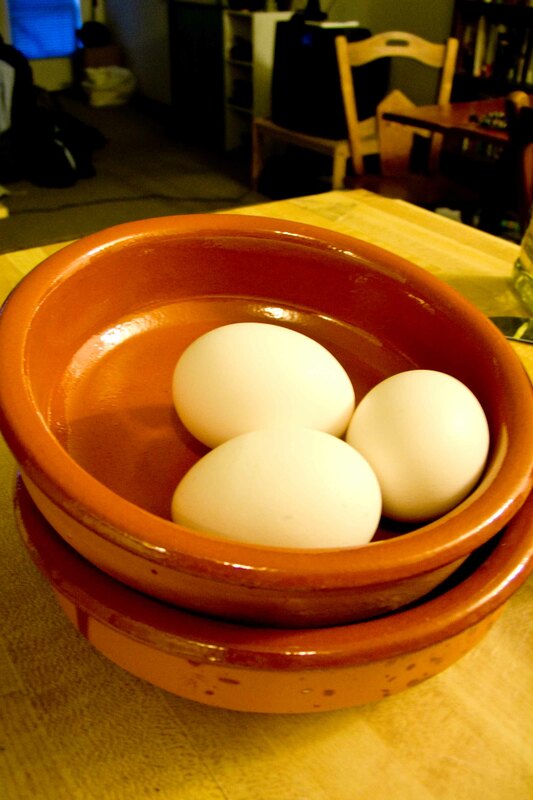 I used to think that a huevo al plato was this specific dish that Jairo would plunk down on the table in front of me with fresh bread, as I toasted my feet on the space heater and wished for the rain to stop so I could get to class dry. 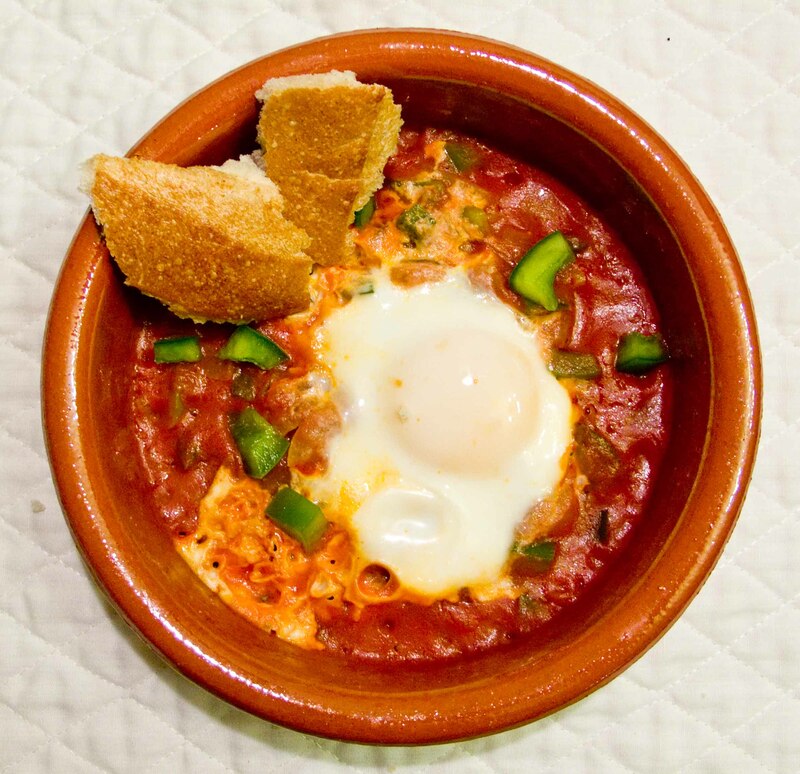 But Doña Margarita of my Spanish cookbook has informed me that in fact huevo al plato refers to the way it’s served – an individual egg in a cazuela. This now seems very, very obvious to me. But I share my shortcomings with you so that you don’t feel alone when those kitchen duh moments trickle in shamefully. If you poke around on the internet, cookbooks, or Spain, you’ll find lots of variations on this theme, especially in tapas restaurants. You won’t find a huevo al plato in Gourmet magazine (if it were still running) or as the main dish of a ritzy chef, but I love it because it’s easy. Ridiculously so. 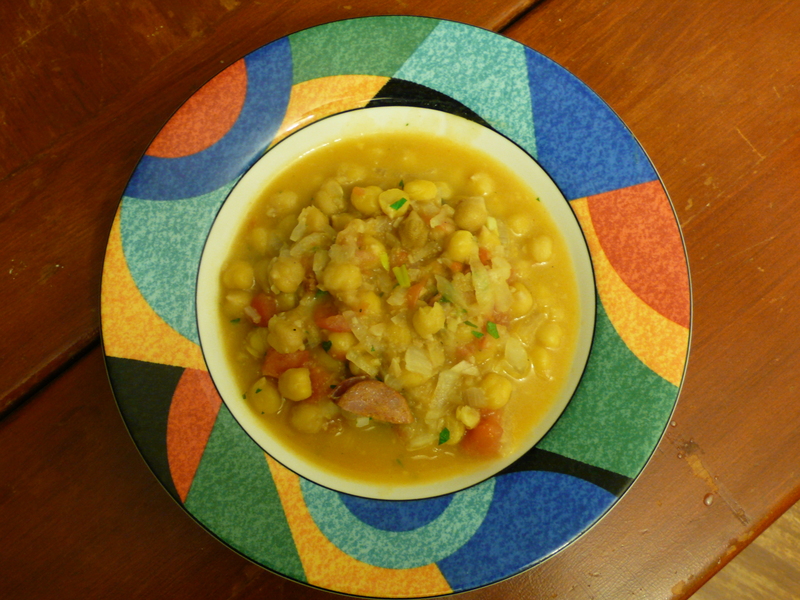 You don’t need a cazuela to make it – just use a small frying pan and slide the mess onto a normal plate and dig on in. In return for the fabulous Sri Lankan Feast, Gabrielle and I invited Michelle and her sister Andrea over for dinner, as well as our friend Brianna (I say our friend, but really these are Gabrielle’s friends who I have slowly usurped). I knew it would be difficult to compete, but I was also excited because Michelle and Andrea are meat eaters (Gabrielle and Brianna not so much), so I decided to make up what I’ve been wanting to eat myself: garbanzos.